We have a projector screen that can easily be lowered or raised electronically, whose top support is 113" wide, and whose physical edges are each 3 and half inches inset from the sides, so the screen itself is actually 106 inches across. The screen requires fastening at the back to something sturdy at the extreme ends of the 113" long support, and I was hoping to hang it from the valence immediately in front of our balcony window, the valence being 114 inches wide. On the left side of the valence is a fireplace, however, and positioned at a 45 degree angle it has a beautiful mantle that is about 5 feet up but whose corner extends about 8 inches into the area underneath the front of the valence. The living area extends into another room on the right of the valence. If the screen is center mounted directly on the valence, however, then it can only be lowered about halfway before it hits the fireplace mantle, failing to clear the mantle by only about four inches. The living area extends into another room on the right of the valence. We have, as I see it, two options other than tossing the projector screen idea entirely. The first option is to buy a 2x4 the width of the screen, and attach it to the valence so that it is offset slightly to the right. Because the 2x4 would be positioning the screen an inch an a half from the valence, we would only need to push the screen two and a half inches to the right. 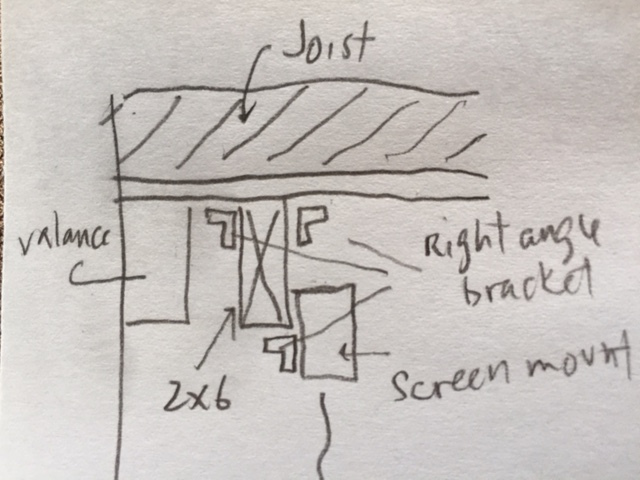 This would extend the screen into the adjacent room on the right but only by two and a half inches athough The screen itself sound still be entirely in the room. It would not be centred on the valence however, and with its top extending into the next room, I fear that would look peculiar. The other solution involves securing a 2x4 to the ceiling instead of the valence and having the screen pushed away from the valence by about 4 inches so that it can be centered on the valence, and mounted onto the side of the 2x4. However, because the screen needs a minimum vertical clearance above its mounting points of about 3 inches this would require additional space between the 2x4 and the ceiling, making attachment nontrivial. I am concerned if I attempt this myself, it will also look bad, but I also fear that I would not be able to afford the services of a professional that could make it look nice. In fact, I don't even know where to begin to inquire for such services or anyone that might know. Obviously, I would like to minimize my costs, but I desperately need some advice from somebody with a bit of experience in home improvement. I can take some pictures later tonight if it will help, but I hope that I have described the situation accurately enoug that at least a general idea has been conveyed. Definitely go with the ceiling mounting. However, I prefer simple, clean & neat. (1) Is the setup I prefer. The top hook (4) is best, as it screws into the structure's framing, if you can find it. If not, then (5) can be screwed into the drywall or plaster to receive (4). (2) & (3) also use just the drywall or plaster & give you positioning flexibility. (6) can be an open or closed (carabiner) S-hook or even just a nut & bolt with washers, so just the top of the chain is removable. It sounds like a 2x4 (which is only 3.5" deep) will not be deep enough to give you something solid to grab through the back of the mounting if you need to lower it by 3". A 2x6 can be attached to the ceiling using right angle brackets lined up with the joists. I would use at least four on each side. Alternatively you could use an angle iron (probably aluminum) that ran the length of the 2x6 if you think that looks better. Then mount the screen to the 2x6. For additional support, you could add angle brackets to the back of the screen mount through the bottom edge of the 2x6. usually, these powered screens have an attachment bracket on the two ends, and nothing midspan. the power cord usually comes out of the one side close to the bracket but not through the bracket. the simplest solution would be to ceiling mount it and just get two offset spacers made. these would be simple wood or plastic blocks (any plastic fabricator should be able to make either, a carpentry shop could do both if they are comfortable with plastic). they are built so that you mount the block to the ceiling with screws, anchors, whatever. then the screen is mounted to the blocks with machine screws (plastic is best as the threads can be tapped right into the plastic). you can make them whatever height you want to ensure the right standoff. a note of caution. these screens typically use a little ac gear motor that rotates very slowly. it tends to cause resonance vibrations that are somewhat tuned to the screen so that the screen assembly damps the vibrations out. if you mount it in any way thats flimsy (like the above sketch) or doesnt use the mounts mounting holes properly, you can vibration that can make a huge vibration in the assembly. its usually worse in anything over 100", and you can wiggle your mounts loose or cause premature wear. its best to mount solidly to the ceiling with the standoffs and the original brackets. Not the answer you're looking for? Browse other questions tagged mounting brackets home-theater or ask your own question. How can I mount a projector to a concrete ceiling? How can I finish a hole in the wall?